It is a calculator application created with focus on the function of the calculator that I need on site work. 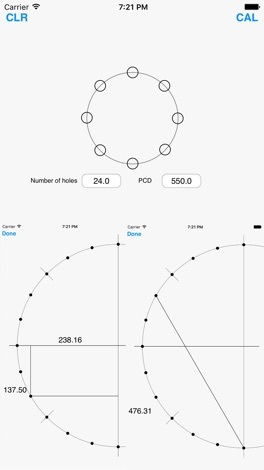 It is a calculator that you can easily calculate without knowing trigonometric functions. 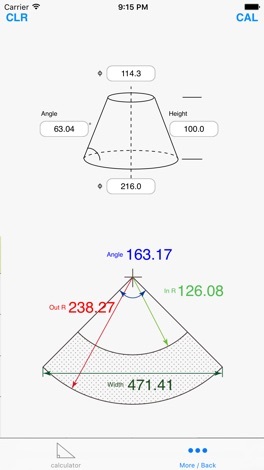 You can calculate right triangle and irregular triangle. Memory, answer memory, π, iteration, trigonometric functions, parentheses can be calculated. 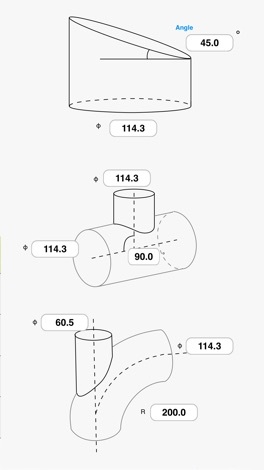 Development of cone (including misalignment), oblique cut of pipe, R cut, T pipe, shrimp pipe, rounded corner, rounded corner (eccentric), deployment of hopper eccentric, deployment of pipe from the end plate, connection pipe to taper pipe Expansion, expansion of screw feathers, PCD calculation is possible. "ANS" button Press and hold to display past calculation results. The numerical value displayed on the label can be input by tapping the white button. By swiping the screen left or right, the right triangle rotates. Swipe up / down the screen to swipe right triangle. Please enter two right triangles and three inequality triangles. 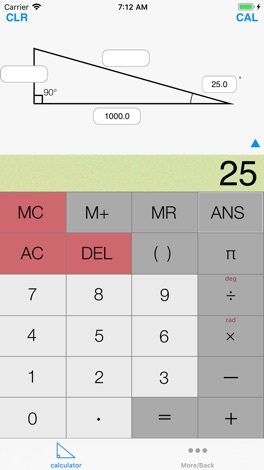 Tap "Cal" and the calculation result is displayed. With the "Cl" button, the displayed value is cleared. It is possible to erase only the designated place by displaying "0" on the label. The numerical value of the calculation result can be displayed on the label and can be used for the next calculation by touching the button and sliding downward. The input method is the same as the calculator part. Expansion of pipes, PCDs and mirrors can be selected by sliding the screen to the left and right. Essentially all input to the button is necessary, but depending on the location "0" is also possible. For rounded corners (eccentricity), double tapping the screen after entering the rounded corner number will switch to the input screen. Please divide the circumference by a multiple of 4. 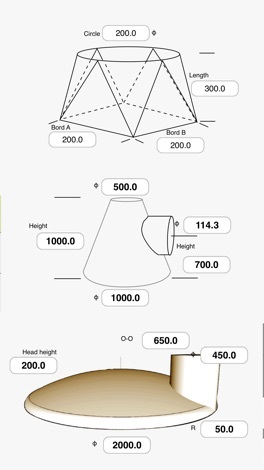 The figure of the calculation result is an image, so it is different from the actual shape.